Recognizes a protein of 57 kDa, identified as p57Kip2. LS174T, Raji, HT29, SK-BR3 cells. Colon or Prostate carcinomas. Recognizes a protein of 57 kDa, identified as p57Kip2. It shows no cross-reaction with p27Kip1. p57Kip2 is a potent tight-binding inhibitor of several G1 cyclin complexes, and is a negative regulator of cell proliferation. Anti-p57 has been used as an aide in identification of complete hydatidiform mole (CHM) (no nuclear labeling of cytotrophoblasts and stromal cells) from partial hydatidiform mole (PHM) in which both cytotrophoblasts and stromal cells stain. The histological differentiation of complete mole, partial mole, and hydropic spontaneous abortion is problematic. Most complete hydatidiform moles are diploid, whereas most partial moles are triploid. Ploidy studies will identify partial moles, but will not differentiate complete moles from non-molar gestations. Complete moles carry a high risk of persistent disease and choriocarcinoma, while partial moles have a very low risk. 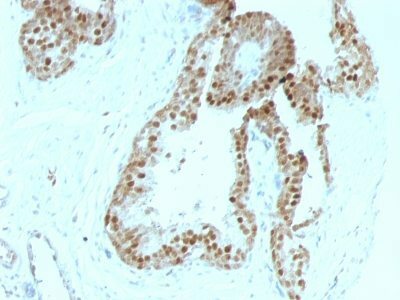 In normal placenta, many cytotrophoblast nuclei and stromal cells are labeled with this antibody. Similar findings apply to PHM and hydropic abortus tissues. Intervillous trophoblastic islands (IVTIs) demonstrate nuclear labeling in all three entities and serve as an internal control. Catalog number key for antibody number 0880, Anti-KIP2 (KIP2/880) The prefix indicates conjugation, followed by the antibody number and size suffix.